ORILLIA — Three dozen fresh leads could help an OPP cold murder case dating back 37 years in Algonquin Park thanks to a huge social media interest. Police hope the public can help identify this young male who went missing between 1971 and 1978. His remains were found in Algonquin Park near Whitney by a hiker close to trail marker No. 5 on the Hardwood Trail. Provincial police say they are “heartened by the number of responses” to a recent public appeal to identify male human remains first recovered in the internationally known and popular Ontario provincial park back in 1980. 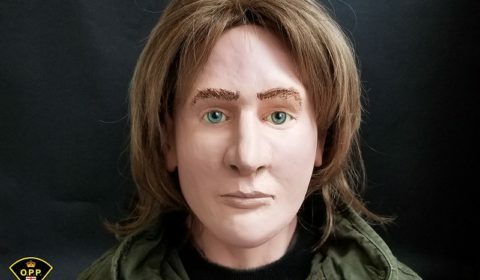 On July 26, 2017, several photos and video of a three-dimensional clay facial reconstruction created by the OPP Forensic Artist were released to the media and on a number of social media platforms. To date, the OPP missing persons’ hotline has received 36 fresh tips from the public. The total number of impressions or times the content was displayed on Facebook, Twitter and Instagram, including English and French content, was 62,904. Videos posted to OPP Facebook, Twitter and YouTube channels in both English and French received a total of 12,273 views. Members of the OPP Criminal Investigation Branch and Missing Persons and Unidentified Bodies Unit (MPUB) continue to follow-up on all information provided and thank all members of the public who have called or provided information via e-mail. On April 19, 1980, a hiker using the Hardwood Lookout Trail near Whitney, Ontario located human remains. The hiker had taken a shortcut off the trail and found the remains approximately 77 metres from trail marker number five. A subsequent search of the immediate area located a size 11, Greb-brand boot, a wallet containing no identification, clothing, a black sleeping bag, a camp stove and an aluminum cooking pot. In 1995, another search of the area resulted in more remains being recovered. Forensic anthropological analysis suggests that the individual was a Caucasian male, aged 18 to 29 years. He had blonde hair varying in length from six to 11 inches, which may have been worn tied back in a ponytail. His belt showed wear at the 32-inch hole. The cause of death is not known. Information recovered from the scene and a stamp found in the wallet led analysts to determine that his death occurred between July 1, 1971 and Spring of 1978. The Criminal Investigation Branch (CIB) investigates major crimes including homicide along with death investigations on behalf of the Office of the Chief Coroner for Ontario. The Missing Persons Unidentified Remains Unit (MPUB) is dedicated to assisting front line police officers with missing persons and unidentified human remains investigations. A partnership between the OPP MPUB unit, the Ontario Forensic Pathology Service (OFPS) and the Office of the Chief Coroner (OCC) has existed since 2006 and we work together to locate missing persons and give a name to unidentified remains.